Range Gripper is excited to extend its special PGA Show wholesale pricing of $15.00 per unit through February 28, 2019. Based on demand, we are also pleased to launch the “Mixed Case” Multi-pack includes nine (9) Range Grippers in eight (8) colors for a total of 72 units or two (2) cases, also at $15.00 per unit. Normally priced at $17.50 per unit, this offer saves $2.50 per unit. Additionally, Range Gripper is offering a Starter Pack for first-time orders that includes 24 Range Grippers, three (3) of each color at $17.50 each. Further reorders have to be full cases. Thanks to the 2019 PGA Show, Range Gripper reached even more golfers, allowing them to experience the many benefits of Range Gripper’s simple, low-cost assurance policy against damaging or losing a smartphone or rangefinder during a round. 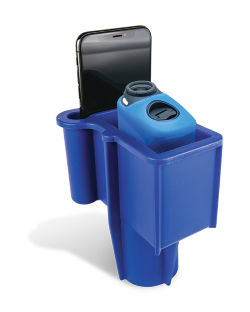 The versatility of Range Gripper allows it to hold almost all models of rangefinders and smartphones within its lightweight, durable and flexible polymer, which won’t scratch electronic cases and screens. Virtually indestructible, Range Gripper has a lifetime warranty. Like most good ideas, Range Gripper grew out of a problem that needed to be solved. Scott Patten built off his father’s frustration at frequently losing and damaging his rangefinder and phone while playing golf. Scott took his dad’s idea for an all-purpose electronics holder and tweaked the design to accommodate today’s electronics. He recruited a team of engineering, manufacturing, marketing and sales support, and a new must-have golf accessory company was born. For more information including purchasing for your pro shop or becoming a distributor, visit www.rangegripper.com.